To say that Anita's kitchen is bustling with activity would be the gross understatement of the year. If she's not cooking, she's whipping up a delicious snack or her cook, Kumari, is busy prepping for the next meal. Fresh vegetables from the market jostle with fruits from her mother's garden on Anita's counters. There's some kind of green everywhere. And if she were writing this, she would not hesitate to add that that includes her compost pit, as well! We had plans of cooking together but there were so many things to do that I ended up watching and hastily taking many blurry pictures in her kitchen. I had a tough time taking pictures in her home - there is a confluence of incandescent, flourescent and blue light. It drove me nuts and explains her exasperation when I say White Balance! to her on all her pictures. Kumari made besan parathas for us the day we left for Agra. This is a recipe from Anita's mother-in-law, the same lady whose goda masala recipe many of us now swear by. According to Anita, besan parathas were very popular in their home for breakfast. She has trained Kumari well. So well that the woman can roll out perfectly round parathas from a triangle. Take a look. Now that you have an idea of the technique, I think you're more than ready for the recipe. Place a cast-iron griddle to heat on medium-low. Add oil and salt to the atta and knead using only as much water as required. The dough should be soft but not sticky. Cover with a damp kitchen towel and allow to rest for at least 10 minutes, while you get the besan paste ready. In a medium bowl, mix besan, ajwain, red chilli powder, turmeric powder and salt. Keep the chopped cilantro in another bowl. Divide the dough into 15 equal pieces, roll each into a ball and flatten. Roll each ball of dough into a circle that is about 4in in diameter. Spread about 3/4 tsp of the besan paste onto half of the rolled out circle and fold over. Press and pat it down so that it sticks together. Wipe off any paste that oozes from the sides and make a mental note to add a little less paste the next time. Spread less than 1/2 tsp besan paste onto half of the semi-circle and fold over into a triangle. Dust with some atta and roll until the paratha is about 6-7in in diameter. Brush off excess flour from the paratha and cook on the griddle on medium-high until the colour changes, about 30-40 seconds. Flip the paratha over and quickly spread about 1/2 tsp oil on the paratha. Cook for about 30 seconds, flip it over and do the same to the other side. It may start puffing up at this point. That's a good thing! Cook, flipping over as necessary, until the parathas has beautiful golden spots all over. Serve hot with a chutney or pickle of your choice. Anita's mother-in-law stored leftover paste at room temperature and made dough as needed every morning. The size of each ball is twice the size I normally use for my stuffed parathas. Kumari used even larger balls of dough! My excuse is that my hands are small! It's always a huge treat to cook in someone else's kitchen or at least watch them cook. I learn new things all the time. Thanks, Anita and Kumari, for letting me get in your way! Update: I am sending this to Susan's My Legume Love Affair, hosted by Jaya. Whoa! how does she roll out circles from triangles?! Well I have never had a paratha this way. Must try. and I won't even try to do the Kumari way. THIS! THIS! I love besan. I didn't know they made a paste! I thought it was like Thepla, you know? And what is that red chutney? Thokku? Tomato? :D I'm so making this. And that pic of Anita's is gorgeous! wow...looks so yummy...love the colour and the clicks too. Love Anita's picture. Absolutely lovely! Tried the famed original Chole recipe from Anita's and its a keeper for life. Next on my to-do list is Kumari's besan paratha. The technique is something I'm familiar with but I've never seen besan parathas made this way. They look absolutely delish. Have to try them out. It is a fab parantha - great for a snack/ or breakfast, or in your brown bag with some pickled green mangoes, or even amla pickle! Sailaja, even the technique of making a circle from a triangle is my MIL's; I had to work on it for a while before I got it. It must have exasperated Kumari when I insisted she make them just so...just an association of this parantha; it reminds reminder me of my MIL, who was a very accomplished cook and from whom I learnt much. This is her original recipe. Manisha, it was gratifying to see you struggle with the WB in my house, but you did a great job with the processing. Dahi makes a great accompaniment to these flaky, crispy paranthas. I am so glad you could be in my kitchen to share some of our fave foods and there are many such occasions. my mouth's watering!!! !2 recipes that i have to try is this paratha....and goda masala...i love it....but just did not get a packet while coming....but i m glad that i can atleast try n make it on my own!!!! Soma, I almost got it myself! Not quite round but almost there! Lvi, I must go look up Musy's besan puri! 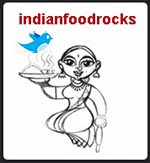 Indu, let me know how you liked it and if you tried anything different! Aparna, you add ajwain to your batter? How cool! I don't use too much of ajwain because there are some tastebuds that are still not too fond of it but gobbled up these parathas with no complaints! Anita, gratified to see me struggle? Why?! Shooting in RAW lets me do whatever I want with it. Almost. Like the blue highlights I gave you! I ate mine as is because they are so flavorful! But, yes, dahi is great with them, too! Veda, there you go! You can make your own now! I should've said - gratifying to note your frustration! And despite RAW and cooking, once could still say, "WB!" :D Those blue highlights must be natural. How becoming. I was going to say what Aparna did- the filling is A LOT like my pakora batter- almost always I add ajwain. And it's in my kadhi pakore-wale as well. Anita, I think you should make a video of the triangle-into-circle technique. :-) And what IS that red chatni!?? Oh these look super-good and duper-yummy. I can almost smell them off the screen :) Thanks ladies! Manisha, I made these parathas of Anita's and they were absolutely delicious. Pel/ Manisha, we traditionally use quite a bit of ajwain in some of our cooking and savoury snacks, in very small quantities though. My mouth is watering for this. I can imagine how flaky this is because I make mooli parathas in a similar manner. Will have to try it soon! Hi - just wanted to tell you we made this today - really simple to make, even for an amateur, and delicious! Also unusual. Thanks much. Wow!! I love any kind of besan paratha. Will make them soon. beautiful picture demonstration. yummmy is the world...dilli winter is at its peak now...am in office drooling over these!! !